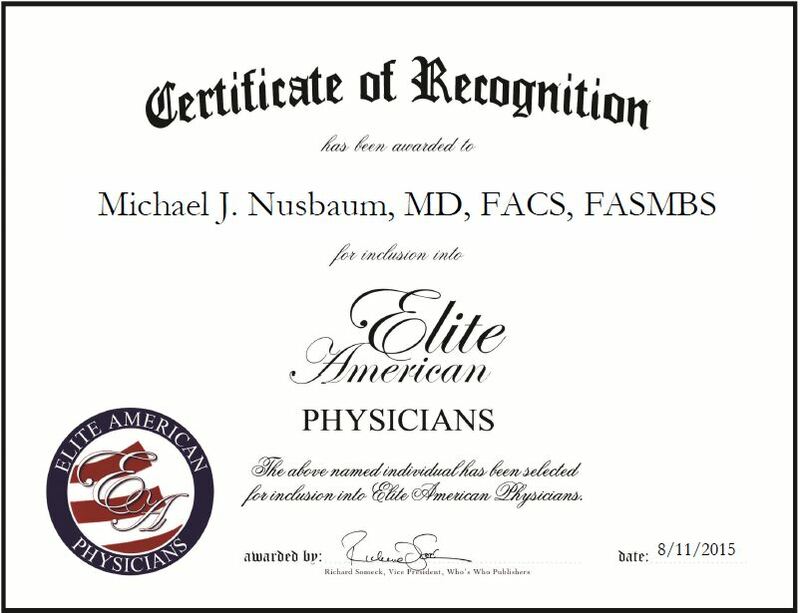 Livingston, NJ, August 11, 2015, Michael J. Nusbaum, MD and Founder of Obesity Treatment Centers of New Jersey, has been recognized by Elite American Physicians, for dedication, achievement and leadership in bariatric surgery. Dr. Nusbaum has 16 years of professional experience, with 10 years of experience at the Obesity Treatment Centers of New Jersey. As a knowledgeable resource in the area of bariatric surgery, Dr. Nusbaum has worked to further his skills in surgical weight loss, along with non-invasive body contouring. All services of Obesity Treatment Centers of New Jersey are completed in-house by dieticians, nutritionists and metabolic specialists. Dr. Nusbaum performed the first successful Laparoscopic Gastric Bypass at Saint Barnabas Medical Center and has performed more gastric bypass surgeries at SBMC than any other surgeon. Looking back, Dr. Nusbaum attributes his success to being a perfectionist with a low complication rate, resulting in patients who are happy with the care they get. They don’t just do surgery, they take care of the patients in many ways. He became involved in his profession because he always wanted to be a surgeon and found bariatric surgery to be very interesting. Among the many highlights of Dr. Nusbaum’s career, one was founding the Pediatric Angel Network, a 501C3 charity that helps sick children after they leave the hospital. Representatives of the charity visit sick children after surgery and raise money to buy gifts for the children. Dr. Nussbaum also contributes to financial hardship situations, related to child care and medical supplies. In the coming years, Dr. Nusbaum will maintain the high care that he presently provides for patients. This entry was posted in Surgery and tagged bariatric surgery, Laparoscopic Gastric Bypass, non-invasive body contouring, obesity treatment, surgical weight loss. Bookmark the permalink.